Do you need an updated passport photo? Learning how to take a passport photo can help you save time and money. However, the government has specific guidelines for passport photos, so it's important to follow the rules in order for your headshot to make the grade. In June 2009, the U.S. Department of State issued a mandate stating that all American citizens must have a passport to travel anywhere outside the United States, including to Canada, Mexico and the Bahamas. 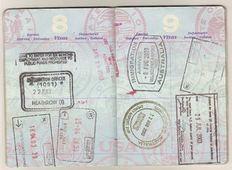 The new rule forced millions of travelers to obtain a passport. This influx of new passport applications prompted government officials to post guidelines regarding proper passport photos. Most people have their passport pictures taken at a photo shop, travel agency, AAA, or at the post office. While this method of obtaining government regulation passport pictures is helpful, it also costs a lot more money than doing it at home. Groom yourself properly, making sure that your hair is not obstructing any of your facial features. Find a plain white or off-white wall to serve as your background. Flood your shooting area with as much natural light as possible. If the space in which you are shooting does not feature a window or door, then supplement it with artificial lights, such as lamps or overhead lights. Ready your camera by placing it on a solid foundation or tripod at eye level roughly four feet in front of you. Stand in front of the camera and ask a friend to zoom in so that only your head and the tops of your shoulders are visible in the viewfinder. If you don't have anyone to take your picture, then use your camera's self-timer. Review all of your shots making sure that there are no visible shadows in the background of your images. If shadows are a problem, shine another light towards the wall and take a step towards the camera. Take multiple shots. Do not rely on Photoshop or other photo-editing software programs to touch-up your passport pictures. The government will not allow edited, re-touched or altered images to appear on a passport. The U.S. Department of State accepts digital photos for passports provided they are regulation size. In addition, all digital passport pictures must be printed on high-quality photo paper and not standard copy paper. At least two copies of the same photo must be attached to passport applications. If you plan to print your digital passport photos at home on a traditional printer, make sure the pictures do not contain excessive pixelation. Visible dots, blurring, inaccurate colors, or other distortions in tone or clarity caused by a substandard printer will cause government officials to reject your passport photo submission. If you don't have a high-quality printer, then visit an office supply store and print out your passport photos there.